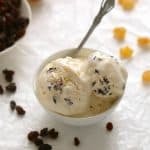 Rum Raisin Pineapple Ice Cream- No Churn . This tropical ice cream is so creamy, dreamy and easy; it will make you dream of Island- Get excited! I remember a period in my life, when I lost my waitressing Job (broke college years). I was devastated; summer was my ka-ching time, no school just work. So this is what I did; get up in the morning, go out job hunting, fill out applications and the best part was getting a pint of ice –cream on my way home. As soon as I got home I would eat it like there was no tomorrow. Calories? Are you kidding me, I did not even think of calories? It tasted so good, grabbing a spoon and just eating right out of the container. Gosh! It was the highlight of my day. You are going to want to do that with this ice cream This went on for about 2 weeks.. maybe 3 until I got a Job, thank God! To tell you the truth, it was bitter sweet for me. Making ice cream always takes me back to that period in my life. I would have never stopped , if I knew about this method. This only take 10 minutes to put together and you don’t even need a mixer, you Fold in the condensed milk, with the whipped cream, add raisins, pineapple and flavoring – place in a loaf pan, let the freezer do it’s thing and voila! Ice cream. It’s that easy, the hardest part is waiting. And did I tell you it is quite adaptable too! Oh yes, I went with some of my favorite combination . Don’t like this combination ? No problem . Leave out the raisins, pineapple and add chocolate and vanilla(my son’s favorite) Enjoy! Add whipped cream to a bowl, then fold in or gently add the condensed milk, followed by the rest of the ingredients Once combined, pour into a freezer-safe container and freeze at least 6 hours to overnight. You want to make this kid friendly, ditched the rum, use rum flavor extract or vanilla. -Do not go overboard with the fruits, or rum, the most I used is a cup of fresh pineapple. - If using heavy cream , whip with a mixer until stiff about 4 minutes , be careful when mixing, started checking after 3 minutes. When you say you can add chocolate or vanilla instead of raisins and rum, do you mean more vanilla extract? Or some kind of chocolate or vanilla sauce? I’d love to make vanilla ice cream like this. This is my daddy’s favourite flavor of ice cream so I had plenty of it growing up. Never tried it with pineapple but I can imagine it being a nice touch. 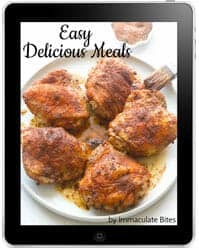 And so easy to make I will definitely give it a try. Thank you! It sure does. Pineapple and coconut are a match made in heaven. I mean where is the coconut in the recipe? Whip the coconut cream for 5 minutes or more until it becomes fluffy and light, with soft peaks . You might have to use 2 cans of coconut milk or replace the rest with cream. I will definitely try this. Looks very easy given that I hate cooking. is whipped cream like cool whip? Delicious i made this for my brother yesterday for his birthday he love rum raisin ice cream he said it reminded him of the ice cream we had on the Cruise Ship. I still haven’t gotten around to make the curry goat or curry chicken yet but when i do make it i let u know. 4cups whipped cream along with 2 cups heavy cream? No it’s 4 cups whipped cream OR 2 cups heavy cream. Hi Nadia! Thanks for giving it a try. You are going to love it ! Aww thanks Jill! Pineapple is my one of my favorite fruits Too! Yay! for a partner in crime. Not a bad thing to be addicted to. What’s left of the mixture is now frozen – it’s delicious before freezing and even better after. No need for shop bought rum and raisin ever again! Thanks Jill, for giving this a try and glad it worked out well for you. Rum and raison is one of my favourite flavours!! I adore this! 🙂 And I especially love that it’s NO CHURN! Me too Nagi!Really quite easy to get carried away.